Valentine’s Day Offer 2013 in Kolkata, Nnoni Valentine’s Offer 2013, Anjali Jewellers Valentine’s Offer 2013. Do you want to know the details of Valentine’s Offer 2013 by Nnoni in Kolkata & West Bengal? Do you want to know the details of Valentine’s Offer 2013 by Anjali Jewellers in Kolkata & West Bengal? Do you want to know the details of Valentine’s Offer 2013 by Readymade Centre Sodepur in Kolkata? Do you want to know the details of Valentine’s Offer 2013 by Imeprial Jewellery Showroom of Kolkata? 14th February – Valentine’s Day, a Day of gifting your beloved one & to make him/her feel special. There is no doubt that girls would love to receive jewellery or nice dress as a Valentine Gift from her beloved one. Prior to Valentine’s Day, every year every renowned shops & showrooms come up with their new collection & discounts as ‘Valentine’s Offer’. Let’s check out what in store for 2013. Valentine’s Offer 2013 of Readymade Centre Sodepur, Kolkata: - One of the renowned shopping stores of North Kolkata, Sodepur Readymade Centre has announced attractive Valentine’s Offer 2013. Sodepur Readymade Centre comes up with Flat 20% Off on selective products as Valentine’s Offer from 8th February to 15th February 2013. Rush to Sodepur Readymade Centre (Address: Station Road, Sodepur, Kolkata / Phone number: 033-25534564) during the Valentine’s Offer and purchase your favourite garment. Valentine’s Offer 2013 of Imperial Jewellery Showroom Kolkata: - Imperia Indian Gem & Jewellery Showroom of Kolkata has declared 51% Flat Off on Making of Diamond Jewellery from 1st February to 24th February 2013 as Valentine’s Offer 2013. Gift your Valentine a Diamond Jewellery on 2013 Valentine’s Day. Rush to Imperial Showrooms of Kolkata – Camac Street [Address: 101 Vardaan Market, Camac Street, Kolkata | Phone number: 033-22873858] and Salt Lake [Address: City Centre-I, Salt Lake, Kolkata | Phone number: 033-23584410]. 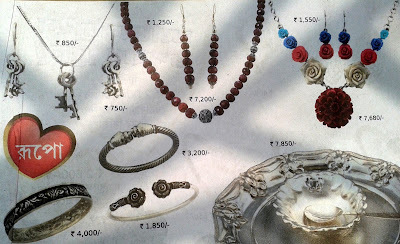 Valentine’s Offer 2013 Teri Deewani by Nnoni: - Nnoni, an Anjali Jewellers initiative, is known for its contemporary jewellery. Over the years, Nnoni has come up with exclusive offers & collections of Costume Jewellery (Silver, Pearl & Costume) to make your Valentine’s Day special. Nnoni has announced their Valentine’s Offer 2013 named ‘Teri Deewani’. This Valentine’s Offer 2013 of Nnoni Teri Deewani is from 6th February to 14th February 2013. During the period, customers will get benefits as well – (1) Free Music CD with Rs.2000/- or above purchase, (2) Up to 10% discount on Silver Jewellery and (3) Up to 20% discount on Costume Jewellery. Check Nnoni Showroom address & phone numbers now and don’t miss to gift your Valentine a beautiful Jewellery Set or Ring purchased from Nnoni. Valentine’s Offer 2013 Mohabbatein by Anjali Jewellers: - Anjali Jewellers presents Mohabbatein (Valentine’s Offer 2013) between 8th February & 14th February 2013. During the Mohabbatein Valentine’s Offer 2013 Anjali Jewellers is giving special discounts & offers on Gold, Diamond, Silver, & Costume Jewellery. Anjali Jewellers Mohabbatein Offer is applicable at all showrooms located in West Bengal & outside. They are also offering 10% Off on Gems & Stones during Valentine’s Offer 2013. Anjali Jewellers Kolkata helpline number is 033-65396399 & Berhampore helpline number is 03482-258498. Now let’s check out Valentine’s Offer 2013 Mohabbatein of Anjali Jewellers – (1) up to 50% Off on Gold Jewellery making, (2) Free music CD on purchase of Rs.4000/-, (3) Hallmark Gold Chain with Locket only at Rs.3900/-, (4) Special Gift for opening new Jewellery Scheme, (5) Special Discount on Diamond Pendant @1980/-, (6) up to 20% Off on Costume Jewellery, (7) up to 10% Off on Silver Jewellery and (8) Special discount of Jewellery exchange scheme. Valentine’s Day Offer by Chandra & Sons Jewellers Kolkata: - On the eve of 2013 Valentine’s Day, Chandra & Sons Pvt Ltd (Jewellers) announced exclusive offers on Gold, Diamond Jewellery making and on Gems & Stones. Chandra & Sons Jewellers Kolkata announced (1) up to 20% Discount of Gold Jewellery making, (2) up to 25% discount on Diamond Jewellery making, (3) 10% Discount on Gems & Diamonds, (4) Cash Back Offer on purchase of Rs.50000/-, Rs.80000/-, 1 Lakh, 2 Lakh, 3 Lakh & 4 Lakh. The Valentine’s Day Offer of Chandra & Sons Jewellers in Kolkata will end on 15th February 2013. Rush to Chandra & Sons Jewellers [Address: 116/1, 117 B.B. Ganguly Street, Bowbazar, Kolkata-12 / Phone number: 033-2237-4494]. Valentine’s Day Offer by Guniea Emporium Kolkata: - On the eve of 2013 Valentine’s Day, Guniea Emporium Jewellery Showroom of Kolkata announced exclusive offers on Gold, Diamond Jewellery making and on Gems & Stones. Guniea Emporium Kolkata announced (1) 20% Discount of Gold & Diamond Jewellery making, (2) Privilege Card on purchase of Rs.50,000/-, (3) 10% Discount on Gems & Stones. The Valentine’s Day Offer of Guniea Emporium in Kolkata will end on 16th February 2013. Rush to Guniea Emporium [Address: 171, B.B. Ganguly Street, Kolkata-12 / Phone number: 033-2241-6173]. 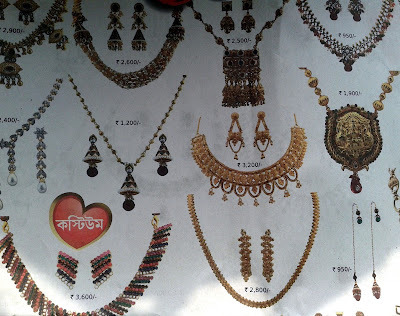 Gunea Emporium does have their Jewellery Showroom at Suri (Birbhum) & Dubrajpur. Valentine’s Day Offer by B.C. Sen Jewellers Kolkata: - On the eve of 2013 Valentine’s Day, B.C. Sen Jewellers of Kolkata announced exclusive offers on Gold, Diamond Jewellery making in the name ‘Basant Utsav’. B.C. Sen Jewellers Kolkata announced (1) 20% Discount of Gold Jewellery making, (2) 8% Discount on Diamond & Gems and Stones, (3) Special scheme on exchange. The Valentine’s Day Offer of B.C. Sen Jewellers in Kolkata i.e. Basant Utsav will end on 17th February 2013. Rush to B.C. Sen Jewellers Showrooms of Kolkata – Vaibhav Lee Road (033-2290-1125), Rafi Ahmed Kidwai Road (033-2265-4098), City Centre-1 Salt Lake (033-2358-0793) and City Centre-2 Rajarhat (033-25266161). So, what are you gifting your beloved one on 14th February (Valentine’s Day 2013)? Valentine’s Day 2011 is just few days away and what would have been a better gift than that of a latest designed Jewellery. For the Kolkata Celebration of 2011 Valentine’s Day and also in Bengal Nnoni Contemporary Jewellery Showroom has introduced special attractive glorious designed Valentine’s Day 2011 Gift Jewellery items in Kolkata Howrah and Bengal at cheap low price range. 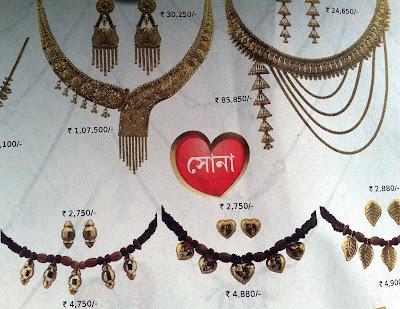 In all Nnoni Shworooms in Kolkata Howrah and Bengal between 6th Feb and 14th February 2011 (Sunday Open) you can purchase exiting heart shaped or other exiting looking contemporary jewelers as a Gift in Valentine’s Day 2011. The special Nnoni’s Offer on Valentine’s Day 2011 Kolkata and Bengal is named MONER MANUSH (6th Feb to 14th Feb 2011). Without wasting much time; visit your nearest Nnoni Showrooms in Kolkata Howrah and Bengal and buy best Valentine’s Day Gift in Kolkata-Howrah-Bengal for your beloved one. Stop thinking what would be the best gift in 2011 Valentine’s Day and here is the chance to Celebrate Valentine’s Day 2011 in Kolkata and Bengal with cheap low price Jewellery with great quality design of best Jewellery Showrooms of Kolkata Anjali Jewellers. The Anjali Jewellers Showrooms in Kolkata Bengal have announced an exiting discounts and Offers on 2011 Valentine’s Day Celebration in Kolkata and Bengal for the people who love his/her partner. ISHQIYA 2011 – The great Valentines Offer 2011 of Anjali Jewellers in Kolkata and Bengal with various latest modern fashionable Gold Jewelries, Diamond Jewelleries in Kolkata of Anjali Jewellers. The special Valentine’s Day Anjali Jewellers Offer 2011 will be available till 14th February 2011 from 6th February 2011. For further details on ISHQIYA 2011 Anjali Jewellers Offer on Valentine’s Day in Kolkata and Bengal please call 9836001014 (Phone number of Bharati Saha) and 9830908760 (Mobile phone number of Prasenjit) or visit your nearest Anjali Jewellers Showroom in Kolkata or in Bengal places. Attraction Valentines Day 2011 Kolkata Celebration Waterside Café Hyatt Regency Kolkata Valentine Day 2011 Kolkata Parties Celebrations Events Dating Places Kolkata Waterside Cafe Hyatt Regency 2011 Valentine’s Day Kolkata Roberto Cavalli Waterside Café Hyatt Regency Kolkata Valentine’s Day 2011 Celebration Events Party nightclubs hotels pubs celebrate Valentine day 2011 Kolkata Romantic places couples attractions discounts deals dinner valentine day celebration 2011 Kolkata Hotel nightclubs Places couples valentine day 2011 Kolkata Dinner Disco Party DJ Nights Valentine Day 2011 parties Kolkata 2011 Venue Valentines Day Celebration events Kolkata Waterside Café Hyatt Regency Kolkata. Are you looking for Valentine’s Day 2011 Kolkata Celebrations Parties and Special Events on delicious foods buffets with DJ music in Kolkata then you should book your seat at Waterside Café, Hyatt Regency Hotel Kolkata for the Valentine’s Day Celebration Party 2011 Kolkata as early as possible. • Time Timings of Valentines Day Celebration 2011 Events Waterside Café Hyatt Regency Kolkata: 7 PM onwards; three hours long function. • Price Cost Charges of Valentines Day 2011 Events at Waterside Café Hyatt Regency, Kolkata: Rs. 2000/- for a person and Rs. 4000/- plus taxes per couple. What is your plan program in 2011 Valentine's Day in Kolkata? How you want to spend 2011 Valentine's Day evening in Kolkata? Not yet finalized or planned your program schedule for 2011 Valentines Day Celebration in Kolkata, don't worry BengalKolkataOnline is coming up with latest Valentine Day 2011 Dinner Party Offers and Discounts in Kolkata available in 2011 for making your Valentines Day 2011 Special. 14th February 2011 - The Valentines Day when we all expresses our inner feelings and Valentines Day is considered as the best time to show how you love some one by making him/her special in the Valentines Day. Don't take you beloved partner to the same romantic places in Kolkata or to the same old restaurants in Kolkata for treat or to the same boring romantic film show in Kolkata. Do something special in this 2011 Valentines Day in Kolkata and make him/her feel that how much you care him/her. Many top-class Hotels and Restaurants in Kolkata provides discounts offers on Dinner Party at Kolkata in 2011 Valentines Day Celebration occasion. And Hyatt Regency Hotel's restaurant Gucci of Salt Lake Kolkata has already announced few exiting 2011 Valentines Day Discount Dinner Party events at Kolkata for Kolkata lovers. Teenagers or young hot Kolkata couples come down to Gucci Hyatt Regency Hotel Restaurant, Salt Lake, Kolkata on 14th Feb 2011 Valentines Day Dinner Party in Kolkata and have a sweet-romantic-delicious dinner celebration through hot and happening ambience. Valentines Day 2011 Best Dinner Party package at Gucci Hyatt Regency Hotel Kolkata details can be obtained by contacting at below address. Valentine Day 2011 Kolkata Tantra Nightclub Offers Dinner Disco Party DJ Nights Dating Places 2011 Valentine's Day Kolkata Tantra Night club Pubs Valentine Day 2011 Celebration Dinner Disco Party DJ Nights Dating Places Kolkata. 2011 Valentine Day Celebration in Kolkata is widely celebrated amongst the teenagers and young couples. There are many Kolkata's Nightclubs, Pubs, Restaurants arranges special and best Valentines Day Dating Dining Party in Kolkata. Nightclubs of Kolkata offers coolest Valentine Day Kolkata Parties 2011 with Disco (DJs) rocking the party. All the famous Kolkata Clubs, Pubs and Restaurant become the busiest Hot & Happening Romantic places of Kolkata on Valentine's Day Night Celebration Party. Are you looking for the details on what is going to happen in Kolkata's 2011 Nightclub Tantra on Valentine's Day Celebration? The oldest night clubs in Kolkata, Tantra Club-Pubs Kolkata is the right destination to spend time on Valentine's Day in Kolkata 2011 with your beloved one. The Santra Room of Tantra Hangout Area and Bodhi Bar of Tantra night club of Kolkata has arranged rocking romantic coolest program on 2011 Valentine's Day Kolkata Celebration. The Tantra, The Park Hotel, 17 Park Street, Kolkata. Phone number of Tantra Night Club Kolkata: 033 2249 9000.